Above is Howard holding our little nephew George Henry. George Henry is a little wild man and tore up Christmas Eve last night at my mom's. He was running around with that camo canteen pictured above and earlier in the evening he had on a Spider-Man do-rag. Howard gave me presents! He gave me a coffee cup from Ulbrich's. Ulbrich's closed something like 20 years ago so this is of tremendous nostalgic value to me. Howard also gave me a leather-bound memo pad/calendar I can keep in my purse stamped on the cover with Covert Vehicle Tracking Systems. Plus there was the Coal Calendar. That is a wall calendar put out by the Centralia Coal Company in Wilkes-Barre, Pa. In big letters it says: "Anthracite Bituminous." Howard had last year's calendar at Big Blue and I have always admired it so this year for Christmas he gave me my own. That is the Centralia Coal Company at left. Howard sells bagged rice coal at CHOICE Of 25. It may be the only place in Buffalo that sells anthracite rice coal for stoves. Other people get coal in their stockings but I get a coal calendar! And here is something else exciting: My nieces Rosie and Millie gave me a pair of pajama pants they had made themselves. They are learning to sew and made pajama pants for everyone and we were all running around wearing them. My mother gave us a bottle of Old Crow! 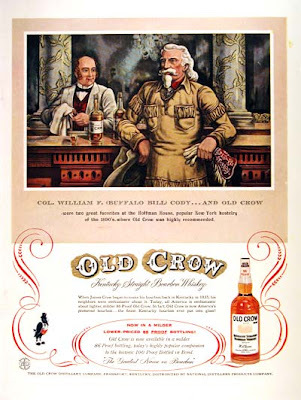 We were thrilled with the Old Crow because the unopened bottle had been my dad's. The funny thing is, that did not seem to matter to anyone but us. Howard had to ask my mother if there was any story behind the bottle of Old Crow, because the price tag on it said $9.50 which is not the price you would pay now. Then she admitted it had been my father's. I do not think she would have told us that if we had not asked! Howard told my mother that every time he saw the Old Crow he would think of her. We all laughed and laughed about that. The carnage of the family Christmas Eve was ultimately tremendous. Here is Howard among the carnage. Luckily I did not drink too much of the Old Crow so this morning I was able to bounce out of bed early and get to Mass. My Facebook friend John Callahan joined me. He had his act together too and both of us got there early enough to say the Rosary and we had even brought rosaries. The Mass was so peaceful after last night! Then again a Nascar race would have been peaceful too after last night. I took this picture during the Offertory when they are passing the plate so it was not too awkward. This is St. Anthony of Padua Church where Leonard Pennario's parents were married and where he was baptized. Did I ever mention that? I just may have. The church looked beautiful with the gold and the poinsettias. In winter I love how they painted the area behind the statues blue. I think the Italian immigrants liked to imagine bright blue Mediterranean skies outside, as opposed to their chilly new Buffalo surroundings. That is my personal theory. At Mass the greatest thing was they rang the bells all through the Gloria. You get to sing the Gloria for the first time after Advent and all through it, as you sing it, they ring the bells. That was thrilling. Home after Mass, I made a frittata with cheddar cheese and butternut squash and leeks and we ate it with cider and sausages and stewed apples. I told Howard, I am afraid I am drinking too much cider. It has become this morning treat that I look forward to. First I was drinking too much wine and now it is too much cider. I cannot win! Well, now it is Christmas. Dear Mary & Howard, "Merry Christmas!" Thanks, Toni. Merry Christmas to you. Thanks for sharing your Christmas. How lovely! Is Howard holding George Henry or restraining him? It can be hard to tell. Merry Christmas. Yourstil, he is definitely restraining him. Merry Christmas, Toni and Larry! You are so nice to be in touch! Nice seeing you after Mass! Merry Christmas! Love you blog! Visions of George Henry buzzing around like that cartoon character, 'Tasmanian Devil' are floating around in my head, lol. Too bad he is too young for some of that Old Crow. That sure would have slowed him down, lol! Larry, I looked up the Tasmanian Devil and George Henry does kind of look like him!